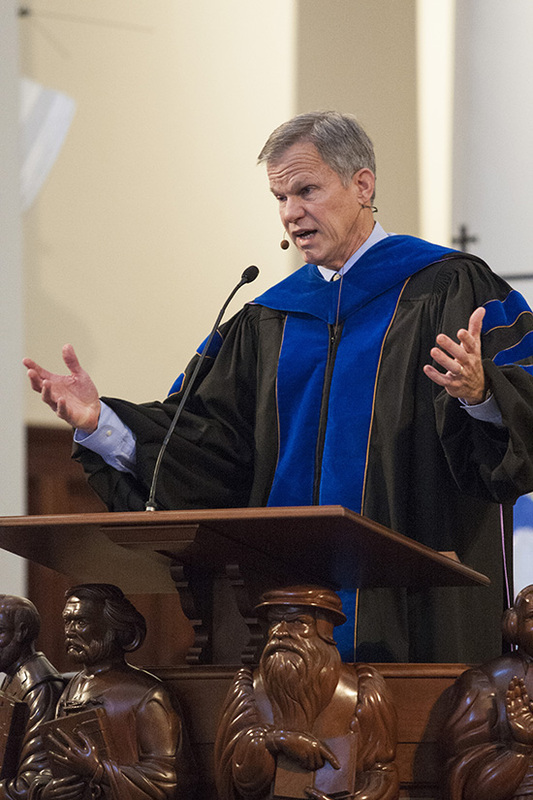 Jesus was always going places, and so will you, Samford University provost and executive vice president J. Bradley Creed told the newest graduates of Samford's Beeson Divinity School Wednesday, Dec. 4. But to follow Jesus Christ's command to go, one must be willing to be sent, and that is different from being willing to go, said Dr. Creed. "When you are sent, you really start to go places," said Creed, who also advised the graduates that they must freely receive before they can freely give and be sent. As Jesus was going about teaching, preaching and healing, he was moved by the people who reminded him of sheep without a leader, said Creed. Jesus saw a mission, and a need for more workers to reap the "low hanging fruit," but he sent out the followers that he had. "He changed his strategy from needing 'more' to 'just enough,'" said Creed, who was a professor and seminary dean at Baylor University before joining the Samford administration in 2001. He holds a Ph.D. in the history of Christianity from Southwestern Baptist Theological Seminary. "The success of a mission is not large numbers, but the willingness of those who have freely received to freely give," said Creed, noting how in the Old Testament case of Sodom, 10 righteous people could have saved a town. "God doesn't require a majority, but just enough." Beeson's 23-member fall graduating class included one Master of Arts in Theological Studies degree recipient, 19 Master of Divinity degree recipients, and three Doctor of Ministry degree recipients. In addition to a diploma, each graduate received a copy of the Holy Scriptures, a gesture that underscores that the commencement program was a combination graduation ceremony and consecration service. "Today we consecrate our students to the cause of Jesus Christ with love, affection and good will," said Beeson dean Dr. Timothy George, adding that while the service was not one of ordination, the school was committing the students "to the service of the church and to the work of God throughout the world." Following a prayer of consecration, Beeson faculty members prayed individually for each student in a special time of blessing. As is Beeson tradition, a shipment of Bibles will be sent to a mission field in the name of the graduating class. This time, Bibles in the Khalkh language will go to an unreached people group in Northern Mongolia, where recent Beeson graduate Gantumur Badrakh and his wife, Deeggi, work with Campus Crusade for Christ. The scriptures will be distributed to the Tsaatan people, also called the "reindeer people," who inhabit the most remote part of the subarctic taiga. M.Div. recipient Jessie McAlpine likely expressed the feeling of many classmates when he said that the morning's event brought a great sense of "relief," and patience about what the future holds. "I'm ready to wait and see," said McAlpine, whose applauding support group at the event included his wife and six other family members. "I'm super proud of him," Jocelyn McAlpine said of her husband's latest academic achievement. McAlpine, who holds a bachelor's degree in psychology from the University of Alabama, is associate minister at Fifth Avenue Bethel Missionary Baptist Church in Bessemer, Ala., and also works at the Veterans Administration. Samford fall commencement activity continues on Saturday, Dec. 14, when about 250 seniors will graduate at 10 a.m. in Wright Center.